As not enough of you know, our parent society, CNPS, has a bicameral governance structure. On one hand, we’ve got the standard state board of directors necessary for any non-profit. On the other, because we have 35 chapters ranging from the redwoods of the North Coast to the chaparral of Baja California, we also have the Chapter Council, where representatives of each chapter get together to talk and hash out policy forthe organization. I’m San Diego’s representative to the Chapter Council. First, memberships will be going up in April 2019, thefirst raise since, well, forever. I’m not sure it’s finalized, but the proposal I heard was $25 for limited income (no change), $50 for an individual membership, and $10/month if you’re a supporter and want multiple membership cards per household. A $5 increase in the individual membership makes sense, since it’s been $45for as long as I can remember. Assuming my memory is correct (hah! ), if I paid $45 for membership in 1995, adjusting for inflation, I should be paying $74.21 in 2018, not $50. A $5 increase seems reasonable to me. I also understand that CNPS will be doing away with $75 family memberships. While this annoys me (we have that membership), the current setup for a family membership is problematic. To pick one example, due to a quirk of the membership renewal, which only puts one name on the “family” membership. Thus, my wife,our hospitality chair, isn’t acknowledged as a CNPSmember, even though she puts in hundreds of hours per year as a CNPS volunteer. Then again, due to inflation, a family membership has the purchasing power of anindividual membership 20 years ago, so there’s somejustice in reworking the system. I’m not sure these are the final prices, but since every member will be affected, I wanted to provide early notice that prices will be going up next year. Despite the static membership prices, state CNPS has become adept at getting grants and such, so the state staff and state programs have expanded dramatically. We now have four people doing conservation, seven people doing rare plants, and expansions in other staff. Along with that expansion, state CNPS is working on programs like the statewide Important Plants Area, botanist certification, and helping to write a big chunk of Jerry Brown’s “California Biodiversity Initiative,” published September 7, 2018 (http://opr.ca.gov/docs/20180907-CaliforniaBiodiversityActionPlan.pdf). State CNPS has also been quite active in climate change issues, dealing with desert solar, rare plant treasure hunts, working to get a botanist certification program up, and running Calscape, to name just a few activities. I’m writing this on September 15, and I suspect that by the time you read it, the news will be very different. Bobbie let me delay a bit because things were changing rapidly. On September 26, the County Supervisors will (from my current perspective) decide whether or not to approve the Newland Sierra project. I won’t be there, due to family issues, but the current bet is that they will approve it. CNPS is considering whether to join the litigation if the approval goes through. By CNPS I mean just that, the binational organization, of which CNPS-SD is a chapter. Our chapter can’t sue on its own, as we arenot an independent entity. In litigation, ultimately the state board of directors decides whether or not to litigate, based on the information that the chapterssend to them. It’s a long process, which is why we’reconsidering it now. But wait, it gets more complicated! On September 13, the judge hearing Sierra Club’s lawsuit against the County over the County Climate Action Plan issued a tentative stay against the County using its carbon offset rules in pending General Plan Amendments, including Newland Sierra, which depends on them. The tentative stay also covers the County’s threshold of significance rulings for greenhouse gases. The judge could certainly change his mind (that’s what tentative means), but if this stands, Newland’s going to have to go back to the drawing board, because they wanted to mitigate 80% of their emissions with carbon offsets. This also affects every other General Plan Amendment project the County is currently considering. Speaking of which, the Lilac Hills Ranch et al. decision by the Board of Supervisors has been pushed back from October 31 to December 9. Coincidence? Probably not. Someone asked the County Planners if they were also considering delaying the Newland Sierra decision, and they still plan to do it on September 26. Mark your calendars, write your letters, and call in! About Otay Ranch...well, I’m not sure what’s going on.The Final EIR was supposed to be out September 11, but that got rolled back to October 9. County Planning is not saying whether Otay Ranch will be heard December9 or not. Before we start cheering, there’s still more. On September 12, the County Supervisors were asked to “provide direction to staff” on “23 Property Specific Requests.” These PSRs are a holdover from the General Plan, decisions about up-zoning particular lots that were put off when the General Plan was updated. As such they require a General Plan Amendment process for approval. The Supervisors were asked to tell staff what to do with these. For most, it was to make them denser. For a couple, including DS 24 out near Borrego Springs, the direction was to follow the existing plan. The DS 24 decision was a win for environmental groups trying to keep a desert wash from being up-zoned into a bunch of water-sucking homes. In any case, Planning now has their marching orders, so they have to come up with a General Plan Amendment to cover the supervisors’ directions. Can they do it by December 9, or not? I’m beginning to wonder if December 9 will be “The Grand Kludge.” I suppose it’s theoretically possible that 25-30 different projects will be shoehorned into one General Plan Amendment to rule them all, and the process will be one awful, multi-day, hearing, all on that one agenda item. Or it’s possible that only Lilac HillsRanch will be heard. Or possibly not even that, if the judge rules non-tentatively against the County these General Plan Amendments will be illegal until the County Climate Action Plan is fixed (again) or until an appeals court overturns his verdict. What will happen? Tune in next month for our next exciting episode of conservation! I’ve been trying, for over a year now, to get permission from the City of San Diego to conduct research on scrub oaks in City parks. 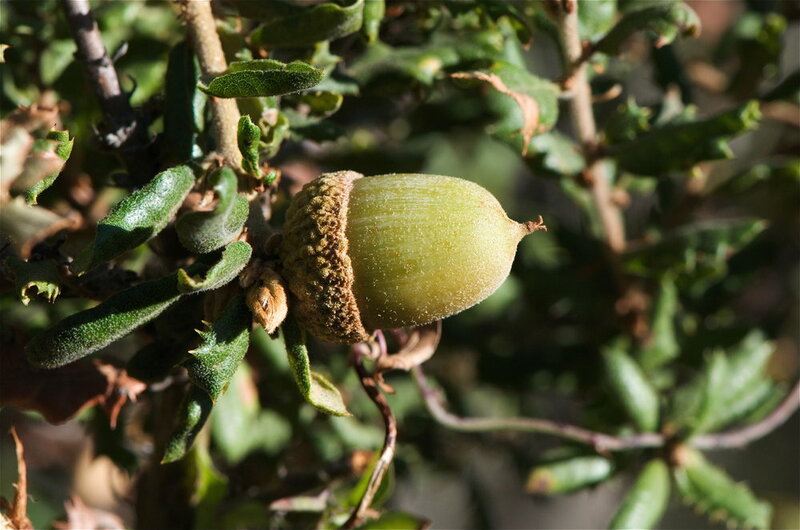 The research would take a couple of weeks, and it’s simply aimed at answering the question of whether Nuttall’s scrub oak (Quercus dumosa) grows over 3 meters tall and away from the coast, thus necessitating an update to its description in the Jepson Manual. The City’s been dragging its heels over whether I’m adequately covered by CNPS’ insurance tohike on trails in parks and collect a few acorn-bearing twigs for herbarium specimens. Permission so far has required a CEQA process and many hours of state CNPS’ staff time, as they deal with the City’s demands. On the one hand, the City wants to brand itself as science friendly. On the other hand, if this happens, I’d be thrilled if City staff (particularly their lawyers) thought it would be good publicity for the City to support science, especially no-cost science directed at implementing their conservation goals. Hopefully the oaks will survive the drought long enough for me to get permission to do the collections.